The name of this Archangel means ‘the justice of God’. Considered to be the angelic ambassador of goodwill, Archangel Zadakiel has the divine mission of helping us to discover the Divine aspects from within ourselves. He assists us in evolving our capacity to see beyond the earthly perceptions related to the relationships we have, including that with our Immortal Self, in order to direct them to the fructification of all the positive aspects that are found in all of these experiences. Archangel Zadakiel helps us remember that we can have a really true spiritual relationship with all those we are prepared to forgive. Helping us remember that relationships truly transcend this earthly experience, we will appreciate even more the spiritual journey offered to us by these relationships, together with the capacity to keep the peace in our souls on the path we have to walk. When we invoke Archangel Zadakiel, he will help us in healing and transcending our ‘injuries’ that we have obtained in our painful experiences, in a way that we can forgive. At our request, the magnificent Archangel Zadakiel will assist us in our spiritual effort of freeing, healing and transcending the negative mental patterns and schemes and the negative beliefs that we develop in the illusion of self-defence from painful experiences and disharmonious relationships. The compassionate angelic mission of the Archangel Zadakiel is to unleash us from the heavy burden of unhealed energies that we still hold within us or hold against other human beings, so that we can regain the freedom to flourish spiritually. Forgiveness is a very valuable sacred journey in each life experience. Archangel Zadakiel assists us in obtaining individual freedom, passing through the golden gate of forgiveness, discovering a renewed trust in our Self, inner strength and inner peace. Forgiving ourselves and others, we will have the chance to rediscover that Life is a joyful journey, helping us in this way to understand and feel that the World around us is safe and secure, sustains us and is filled with love! He helps us heal our memory problems and helps us improve other mental functions. Many erudite people consider/believe that Archangel Zadakiel was the one who stopped Avraam from sacrificing his son, Isaac. Cabala describes Archangel Zadakiel as the leader who helps Archangel Michael to protect us and free us from our inferior energies. Zadakiel is considered the archangel of coordinating the memory and that is why, together with Uriel, he is of great assistance to students. Archangel Zadakiel has a very gentle and good angelic presence. His energy is supreme compassion which helps us in a natural way to perceive the divine in everything and everywhere. His colour is an unearthly shade of mauve/violet, which gives us an infinite state of peace. He will come every time we invoke him with a loving pure soul, to help us free ourselves from karmic fears and blockages, bitterness and the burden of the incapacity to forgive ourselves or others. 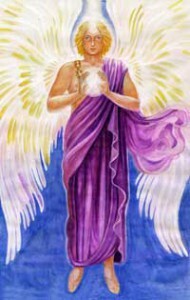 Zadakiel helps us obtain the freedom through forgiveness and he is known as the patron Archangel of those who forgive. For this reason, invoke the Archangel Zadakiel to help you eliminate the toxins from anger and lack of forgiving. Zadakiel helps us see others with compassion instead of harshly judging them.